The Chamber of Commerce Marine Committee welcomed Dennis Durgan at the June 6 meeting. NEWPORT BEACH ― In conjunction with the new harbor management pilot program beginning on July 1 in Newport Beach, the city hired a new harbormaster. Dennis Durgan has taken on the role of harbormaster one month prior to the city of Newport Beach assuming responsibility of harbor operations. Newport Beach Harbor Resources Manager Chris Miller introduced Durgan at the city’s June 6 Chamber of Commerce Marine Committee meeting. The meeting was held at Marina Park where Durgan’s office is situated. Durgan, who grew up in Newport Beach, spoke briefly about his sailing background and his harbor plans. From racing sabots in the local harbor to competing in the America’s Cup, Durgan said he has been sailing all his life. He also mentioned his love for fishing, diving and a no-wake harbor. One of Durgan’s goals, coincidentally, is to have a harbor with no wake in Newport Beach. Other plans, Durgan mentioned, are to regulate standup paddleboarding as well as hold town hall meetings. 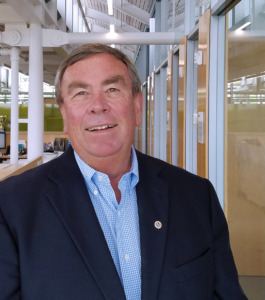 “Set up some town halls with all the yacht clubs, sailing clubs and get everyone’s input so we can make the harbor better ̶ that’s our ultimate goal,” Durgan stated. Durgan will be monitoring harbor-related activities such as boating, paddleboarding, noise level and public docks. His ultimate role is to ensure the harbor is welcoming and safe for all users. Durgan, as well as other city staff, will have the authority to issue municipal citations for those violating city ordinances, according to Public Works Director Dave Webb. Webb also said Durgan’s position as harbormaster is currently part-time but may evolve into a full-time position. Lt. Mark Alsobrook is still the harbormaster, Webb confirmed, overseeing the law enforcement side of Newport Beach, Dana Point and Huntington Beach. Alsobrook is stationed at the Orange County Sheriff’s Department in Corona del Mar.